RNA are molecules formed from assemblies of ribonucleotides, which have a very large number of function in the cell. The RNA molecule is composed of a chain of ribonucleotides (adenine, cytosine, guanine, uracil) connected to each other by nucleotide bonds. Their order is dictated by the deoxyribonucleotide sequence in theDNA. RNA is obtained from the transcription of DNA by an enzyme (RNA polymerase) which essentially recopies its sequence. Ribonucleotides differ from deoxynucleotides by the presence of an OH in the 2nd ribose, and also by the fact that thymine (T) is replaced by uracil (U). Unlike DNA which is usually structured in a double helix, RNA can adopt very different conformations, closely linked to its function. 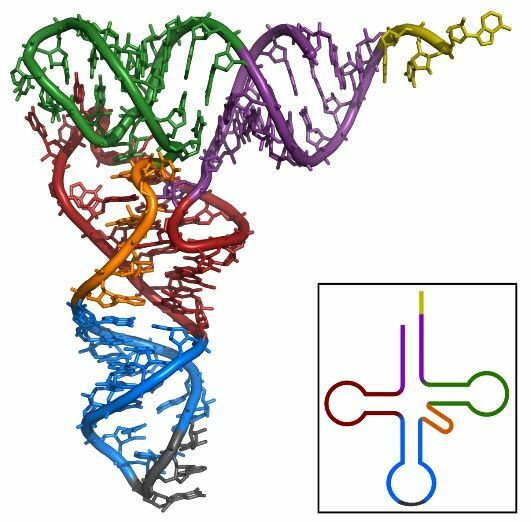 Some RNA molecules are simple strand, stem-shaped loop (by pairing with complementary bases), clover-shaped (transfer RNA), etc. interfering RNA (siRNA, miRNA etc.) regulates gene expression by targeting the degradation of specific messenger RNA or by inhibiting protein translation. There are other families and new classes (snoRNA, ncRNA etc.) are regularly being discovered. The RNA in some viruses (the tobacco mosaic virus, HIV etc.) forms the genome (whereas this function is fulfilled by DNA in the large majority of organisms).